This dish was mentioned in a very early post, but my husband has been working on it and it is definitely worthy of its own post now. It was just delicious and is quite different than most of our GAPS dinners. Leftovers also reheat well. Fit the grating blade onto the food processor and grate the head of cauliflower. Steam the grated cauliflower for 3 minutes. Set aside. Chop the broccoli, bell pepper, and carrot and set aside in a bowl. Chop the onion and jalapenos (if using) and put them in another bowl. Lightly scramble the two eggs so that they are about half cooked, set aside. In another small bowl, mix together the toasted sesame oil and the vinegar, set aside. Heat the sesame oil in a large iron skillet or wok so that it is very hot but not smoking (the surface of the oil will ripple). Put in the grated cauliflower and stir constantly, keeping the heat on high. Keep cooking like this until the cauliflower begins to brown, at least 3 minutes or so. Add the mixture of toasted sesame oil and vinegar and stir. Add the onions and jalapenos if using. Cook for several minutes until the onions start to soften. Then add the other veggies and saute to until they reach the desired level of doneness. Turn off the heat and add the eggs, stirring until they finish cooking. I also recently posted a similar recipe on my blog about cauliflower "rice" stir fry. Cauliflower is the perfect substitute for rice. Hi Janet, please post a link to your recipe, I'm curious to see what you did :) It's always fun to try new ways of doing these things. I agree that cauliflower works so well as a sub for rice. Oh!! This looks and sounds delicious!! I think I have most of the ingredients on hand, maybe not the broccoli and my husband can't tolerate any kind of peppers, but I think I'll make it tonight anyway (just modified, lol!) I was going to make a chicken stir-fry something or other, and this would be the perfect side dish. I miss rice so much! What a yummy recipe, will try it today as I have some cawliflowers needing to be cooked quickly. The sesame oil must add a nice taste ! I made this without any peppers, and it worked really well! I also didn't have any sesame oil on hand, which would probably make it divine, but it tasted great nonetheless. I added carrots, summer squash, broccoli, and green beans as the veggie medley. Great idea! Can't wait to try this! 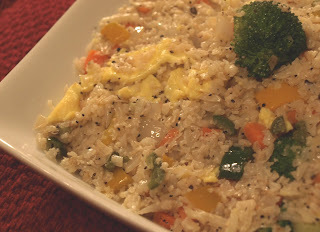 Would have never thought to use cauliflower to make fried rice, but I actually think this tastes really good. Thank you! This is very tasty. Even my kids love it.